You have no sea – you like boogieboarding – you got a playhole or a surfwave on a river -> go for it!!! 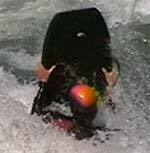 Riversurfing is really great fun and supereasy. This article gives you some basic tips for riverboogie’ing and a lot of how-to’s for the manoveurs we are able to do. Hope you enjoy it! wave. When you move your body to the back, you go higher on the foampile which is useful for the setup of some tricks. with the rails and carve it like crazy. 180° Boardspin You are lying in the eddy and while you are crossing to the wave, just spin the board so you reach the foampile with the back of the board facing upstream. On the backPosition your body with the back on the board – now ferry in the wave and enjoy the ride on the back. That’s really big fun and if you learn to carve hard you can use the power from a carve for a nice trick. Just use the 2nd way of positioning your hand. Push the carving edge in the water with your elbow and pull the other edge out of the water – therefore your boogieboard is really edged properly – if you go fast from one edge to the other then you are rewarded with a cool carving and lots of spray. Bodysurf with the board in front of youStart in a normal frontsurf, now move your hands to the back of the board and just push it to the upriver. You are now in a bodysurf with the board in front of you, so just enjoy it for as long as you can. If you want to finish the move, just let the boogieboard slide under your body and go for the next trick. Bodysurf with the 90°turned-board in front of you Same as the above one, but you twist the board while you are moving it upriver and then you twist it back to normal when you end the trick. Move your body forward and initate a spin with one hand. Put your feet in the air and as soon as you are surfing backwards press the nose of the board underwater and hold your breath. When you have no more air left, just spin back to a frontsurf. On the knees – easy styleYour are surfing straight forward, position your hands to hand style 1 (like Babsi on the picture) and move one knee on the board – just bend it/move it forward.Stabilise yourself with the fin on the other feet. If you want to go for a kneespin then bring the second knee on the board. The easiest way to sit on your board and read a magazine or enjoy the landscape is to go for the On the knees – easy style. Then just reposition your feet so you are sitting cross-legged on your boogie. To be shot 360° BoardspinWait for a bounce or start one with the ollie-technique (same as sk8, snowboard & kayak) – now be quick: while your body is in a bodysurf you have to spin the board in the air. As you finish with the boardspin, just huck it under your body and you did your first boardspin. Again one of those tricks that start ideally with a bounce. Hands are in position 2 and you are ready to fly: move the board from under you body to the side (picture 2 & 3). Now for extra styling points turn the board in the air. 90° in front of you with lots of air is the thing you want to achive. Finally it’s time for the landing. Turn the board to the normal position while you position it under your body again. That’s it!!! BoardbluntOne of my favourites: Similar to the tricks above but this time you want to turn the board from front to back over the nose. (pictures 2 & 3) After the blunt you are lying the board, that is tail-upriver. Do a 180° boardspin and you are done. First blunt as above but as you land the board backwards, go for a Boardblunt of the tail of the board. If you are really fast you can do these 2 blunts in one smooth move – pretty cool.